Dr Max Pemberton writes about why he supports Maurice Saatchi’s Medical Innovation Bill in the Telegraph. Doctors are too scared to deviate from evidence-based medicine and innovation is being stifled. In recent years there has been a seismic shift in the way that doctors practise. The mantra that young, fledgling doctors repeat to themselves endlessly is “evidence-based practice”. On the face of it, this seems sensible. Of course doctors should only prescribe or recommend treatments for which there is a clear, empirical evidence base. Modern medicine is founded on the principles of scientific inquiry; a hypothesis is put forward, tested and proved or disproved. But, as any doctor will tell you, in real life things are a lot messier than that, and nowhere more so than in cancer management. Here, evidence is not always as clear and decisive as we would wish it to be. When I worked on a paediatric cancer ward a few years ago, I remember being struck by how little evidence was available to support many of the treatments that were at the clinicians’ disposal. While evidence-based practice is noble in theory, in reality, it’s simply not always realistic, given the complex nature of cancer when its multiple variables, contributing factors and idiosyncrasies are taken into account. This is what makes medicine as much an art as a science. But worryingly, while doctors know that evidence-based medicine is not always the best choice for treating their patients, they have, in recent years, become increasingly scared of deviating from the standard treatments available to them, even if these don’t appear to be working. One man is trying to change this. Maurice Saatchi, the advertising guru who sits in the House of Lords, last week launched his Medical Innovation Bill, with the specific aim of changing the current culture within medicine that makes doctors fearful of the new and untested. I give it my wholehearted support because I despair at the way medicine is heading. It’s a tragic indictment of modern medicine that too often innovation is jettisoned in favour of the status quo – not because it’s in the patient’s best interest, but because of the fear of being sued. This defensive medicine is at the heart of so much clinical practice now. Several factors have coalesced to create an environment whereby evidence-based medicine is something to hide behind, rather than simply a gold standard to inform decision-making. The seeds of this defensiveness were sown in the medical profession’s consciousness following the fall-out from the Harold Shipman case. One of the unintended consequences of the regulation that came in as a result was that, suddenly, doctors and what they did for their patients was under incredible scrutiny. It was no longer assumed that the doctor would, de facto, have the patient’s best interests at heart. The authorities became increasingly suspicious of doctors and what they got up to behind the closed doors of their surgeries. A culture of fear crept into the medical profession. This was against the backdrop of the insidious creep of the compensation culture and the rise of the no-win no-fee lawyer. Also, as hospitals have become run increasingly like businesses, so a new ruling class has emerged from within health care – the managers. They tend to be wary of any innovation or deviation from protocol that might expose the hospital to litigation risk. With often little or no experience of health care at the coalface, they struggle to grasp the speed, daring and courage needed for medical innovation. So they hide behind protocols and policies and mete out punitive consequences for any clinician who deviates from them. Protocols have solidified into monolithic rules – not to help patients but so they could be waved across a courtroom to defend the hospital against complaints. The current climate has resulted in a loss of professional autonomy and transmogrified doctors into tick-box automatons, no longer guided by guidelines but strangled and suffocated by them. Mavericks used to flourish in medicine, but they have now been stamped out – branded unacceptable variables of unpredictable risk. 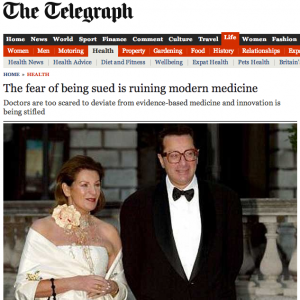 All of this has coalesced to mean that the fear of being sued has ruined modern medicine. It’s not good for the doctors, who are constantly questioning what they do and don’t do – not on behalf of the patient, but because they fear having to justify what they are doing in front of cross-examination. And it’s not good for patients, who are denied the chance of cutting edge, untested and unlicensed treatments when they have little or nothing to lose. Things that might be in the patients’ best interests are not pursued, meaning that nothing moves forward for them, or indeed future generations. It’s this that the Saatchi Bill is designed to address. Its origins lie in Lord Saatchi’s devastation as he watched his wife, the novelist Josephine Hart, die of ovarian cancer last year. He has managed to turn his grief and sense of loss into something that has the potential to bring untold benefit to future sufferers. The drafting of the Bill, Lord Saatchi explains, is designed to safely advance the freedom of doctors to innovate and strive for advancement, rather than simply accept the status quo because it means that no one can sue them. This doesn’t mean that doctors will have free rein to experiment on a patient. They are still bound by professional guidance and their duty of care still remains to their patient. But what it does mean is that, in cases where the evidence is shaky or wanting, or is not yet clear, the Bill sets out a code by which doctors can try alternatives. In this way, it actually offers the patient more security than they have at present because it provides, for the first time, a robust legal framework to encourage responsible innovation in diagnosis and treatment. One in three of us will get cancer. If the survival rates are going to improve, doctors must be free to innovate, and this is what Lord Saatchi’s Bill does. I hope our politicians can see this, too. →READ in the Telegraph: Dr Max Pemberton writes about why he supports Maurice Saatchi’s Medical Innovation Bill in the Telegraph.